Okay, so this may not be directly for Dad, but it definitely will bring a smile to his face on Father’s Day! 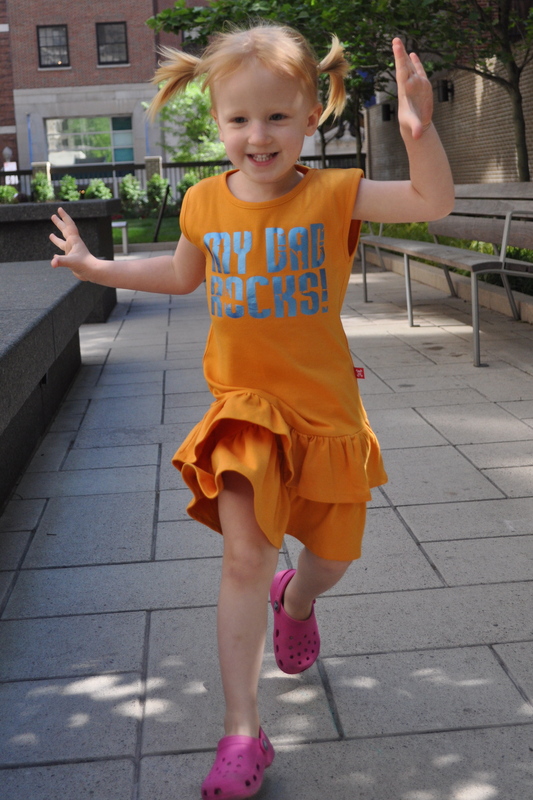 The “My Dad Rocks” dress by Stardust is an adorable dress with just a bit of attitude. Imagine your little girl stepping out on Dad’s big day with a dress that says it all. The large ruffles at the bottom add a perfectly feminine finishing touch, but the metallic blue writing makes it a bit edgy. The 100% cotton dress is soft and has a nice weight to it. It happened to be very windy out when she wore it and the dress held it’s own. Kieran loved running around in her new dress and had to show it off to a few people, too (the doorman and the cashier at CVS, to name a couple.) In addition to the great quality, the price can’t be beat—just $20.00 USD plus $3.99 shipping. At least for the dress, the sizes seem to run big, so keep that in mind. Kieran just turned 3, but is very tall (40 inches), and fit in the 3-4 year size. I am a long-time Beastie Boys fan and have decided that our 3-month-old son must have their Beastie Baby romper added to his wardrobe. They have so many more unique and funky designs, I can’t wait to get back on their website! Stardust is a UK-based company I’ve added to my short-list of favorites. They have been making baby and kids clothes since 1998 out of their London workshop. They have their full line available on their website or you can view a limited line on their Etsy store. Inspired by popular culture iconography, punk rock and a splash of kitsch, they aim to add a sprinkling of pizzazz and panache to young families everywhere. Stardust has generously offered our readers a 20% discount off items on their retail website. Just enter STARDUST at checkout to receive your discount. * That’s IT Mommy did not receive monetary compensation for this review. Heather did receive the dress mentioned in this post to facilitate this review. Those are adorable and all of their other stuff is just as cool. I think I may need to purchase Adeline a couple new things from here. Great Find, Heather! Thanks for sharing.